The ADA News reports that the difference in earnings between dentists who own practices and nonowner dentists is narrowing, according to a paper developed by the ADA Health Policy Institute and published in The Journal of the American Medical Association in July. 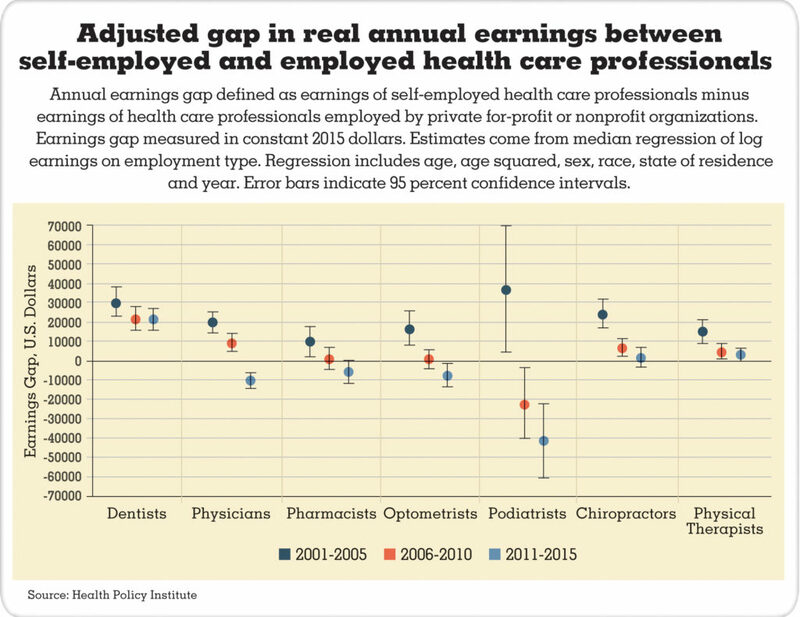 Marko Vujicic, Ph.D., chief economist and vice president of the HPI, co-authored the paper, Earnings of Employed and Self-employed U.S. Health Care Professionals, 2001 to 2015, with Kamyar Nasseh, Ph.D., a health economist with HPI. The researchers used the 2001 to 2015 American Community Survey to compile their paper. The analyses were restricted to 175,714 self-identified dentists, physicians, pharmacists, optometrists, podiatrists, chiropractors and physical therapists aged 30 years and older who worked at least 40 weeks per year and 20 hours per week. More than 20,000 were dentists. I would love to see the ADA continue this research and highlight the patient experience and the doctor experience/happiness/stress levels as a result of this trend shift. (And, see those effects at various life stages/ages). Much is touted about having someone else manage things for you, like a DSO, so I would like to know if that is more stressful or less stressful for dentists. Knowing about the quality of life of helping member dentists succeed would be beneficial. Thank you for your research in this paper. What type of entity should a dentist consider selecting and why? Credit .home loan line equity - Coloradocountydemocrats on Personal line of credit, home equity line of credit, or personal loan: Which Is right for you? Loan line rates credit interest - Employflathead on Personal line of credit, home equity line of credit, or personal loan: Which Is right for you?